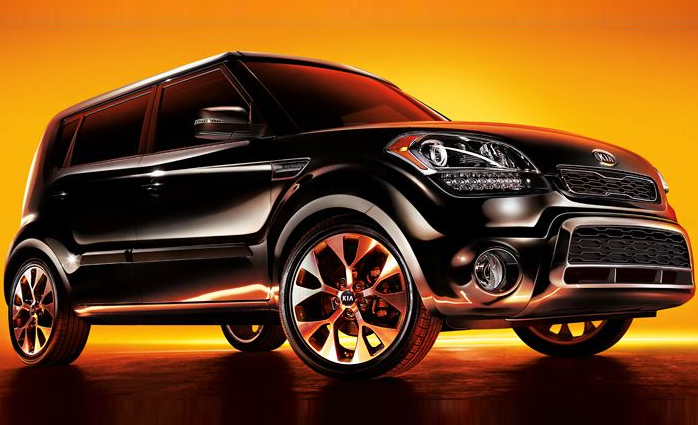 Price: $23,575 for our test model Our test model was the 2013 Kia Soul ! (That exclamation mark is the trim designation, incidentally) painted in the popular apple green shade called Alien. It had a base price of $19,900, and that included quite a bit: Air conditioning, power windows and door locks, an Infinity audio system with AM/FM/CD/MP3 components, cruise control, satellite radio heated seats, six speed automatic transmission, tilt and telescopic steering column, 60/40 split rear seats, heated power folding mirrors, and other items. Adding a premium package, leather seats and other items brought the final price to $23,574. The Soul we drove had the amped up 164 horsepower, 2.0 liter engine which gave it some kick and pick up. The base model at 138 horsepower feels underutilized and not very impressive to drive. For 2013, the changes include making BlueTooth standard for the base versions that are equipped with manual transmission, some changes to the Kia badging for all models and power-folding outside mirrors for the ! trim level. If you get the entry level Soul, you'll get a 138 horsepower 1.6 liter four cylinder engine that's all-new, and it has a rating of 27/35 or 29/36 if you get an Eco package with different tires and auto stop/start. Meanwhile, if you spring either for the Soul + or ! models like our test example, you get that 2.0 liter four with 164 horsepower. 26 miles/city and 34 miles/highway, not top of the class for fuel efficiency. Gas mileage rating is 26/34, with 29 combined. Annual fuel costs are $1850. based on 15,000 miles of driving at $3.55 a gallon. The federal government estimates you will save $2,100 over five years in gasoline costs of an average vehicle if you buy the Soul. The Soul has created a blueprint of its own, and the other two key competitors, the Scion XB and the Nissan Cube, simply don't keep pace. We give credit to Kia for staying true to this model that has created its own following that spreads over various demographics and consumer profiles. Why? It's fun! Why? It's boxy and roomy with plenty of cargo room. Why? You can buy the entry level version for $16K. Just like the Kia formula for its other models, this is no different. Style points - 100; Innovation and Forward-Thinking points - 100. Interior Layout and Features - enough to make it a good seller. Safety - ah, well more about that in the 'Safety' section. The Soul is, of course, nothing if not unique. Leather, heated seats with excellent leg room in front seats. For city driving, now enjoy the heated, power-folding mirrors. EZPZ pull up 60-40 split folding seats. Cruise control and 18" alloy wheels for starter looks. Tilt telescope steering wheel for customized position and driving. Sunroof. The Soul is, of course, nothing if not unique. It's shape is tall, it's got some unusual character lines and stylistic touches that catch the eye, and there's not a wasted bit of space anywhere. Every inch is used for something, thus making the best use of the car itself. We especially liked the interior because it was pretty roomy, colorful, and interesting to sit in without a lot of dull, cheap looking materials. Kia has managed to make an interior that looks more expensive than it is, thus allowing consumers on modest budgets to get an ego boost sitting inside the Soul. The vehicle is stacked with airbags, Rear-camera assist, remote keyless entry, ABS brakes, traction control and stability control, and LATCH for children. Oversized tail lights in rear of vehicle. National Highway Safety Administration gave it a "GOOD" rating. Note, this review is for the 2013 model; however at the time we posted it the Insurance Institute for Highway Safety rated the 2014 model of the Soul which received a "POOR" rating. In a written statement, KIA said that the IIHS goes beyond the government required safety standards and the vehicle received top ratings from the National Highway Safety Administration. Dual front air bags, front mounted side airbags, full-length curtain airbags, front active headrests, anti-lock brakes with brake assist, traction control and stability control, vehicle stability management, among other things. Kudos to Kia for all the 'comfort-features' packed into the Soul, making it a brilliant value-added car and the buyers continue to award it a best seller year after year because of this. The features in this box-trot model include: 8-Speaker stereo, SIRIUS satellite radio, Bluetooth for hands free talking, power windows, AM-FM-CD-MP3 Infinity Audio System, USB and auxiliary input jacks and steering-wheel mounted Bluetooth, audio and cruise controls. Optional features include a UVO infotainment system, HD Radio, a rearview camera, an Infinity sound system and push-button start. And, so much more. The base model's standard equipment includes 15-inch steel wheels, full power accessories, air-conditioning, a height-adjustable driver seat, cloth upholstery, a tilt-and-telescoping steering wheel, a 60/40 split-folding rear seat, a-trip computer, Bluetooth phone connectivity and a four-speaker sound system with CD player, satellite radio, an auxiliary audio jack and an iPod/USB audio interface. When equipped with the optional automatic transmission, the base Soul gains keyless entry, rear privacy glass, cruise control and a height-adjustable driver seat. The Soul+ includes all the above along with 16-inch alloy wheels (optional on base), heated mirrors, dash-top and center console storage bins, a leather-wrapped steering wheel, some faux metallic interior accents and two additional speakers. The available Audio Upgrade package adds automatic headlights, a rearview camera, the Uvo hands-free media player interface and an eight-speaker Infinity sound system with HD radio and tricolor speaker lights. The optional Eco package adds fuel-saving features like an automatic stop/start system, an upgraded battery and low-rolling-resistance tires. Also available is a sunroof bundled with foglamps. The top-of-the-line Soul ! adds 18-inch alloy wheels, a sunroof, power-folding outside mirrors, upgraded headlights, foglamps, LED daytime running lights, houndstooth pattern two-tone upholstery, an auto-dimming rearview mirror and the Audio Upgrade package. Optional on the ! is a Premium package, which adds keyless ignition/entry, leather upholstery, heated front seats, automatic climatic control and a navigation system with real-time traffic and a touchscreen interface. Brilliant styling all the way for this leader. The grill is accentuated; taillights and headlights are exaggerated this year giving it a bit of a bulldog appearance. That assertive design language continues to the 18" tires. Interior dials and well laid out, however, the finish screams of plastic. Clean and bold two tone color-blocked interior throughout. I think the Soul is on the verge of becoming an iconic shape, just as Volkswagen's Beetle became an iconic design, and the same goes for the Mini Cooper. The Soul is just charmingly quirky, yet practical, and it also has some pretty futuristic overtones in the styling details. The leader in warranties offers a 10 year, 100,000 mile limited warranty on the powertrain, 5 year, 60,000 mile limited basic warranty. 5 year, 60,000 mile roadside assistance program offered, see Dealer for more. The Soul comes with a 10 year/100,000 mile limited warranty on the powertrain, five year/60,000 mile limited basic warranty, and a five year, 60,000 mile roadside assistance program.